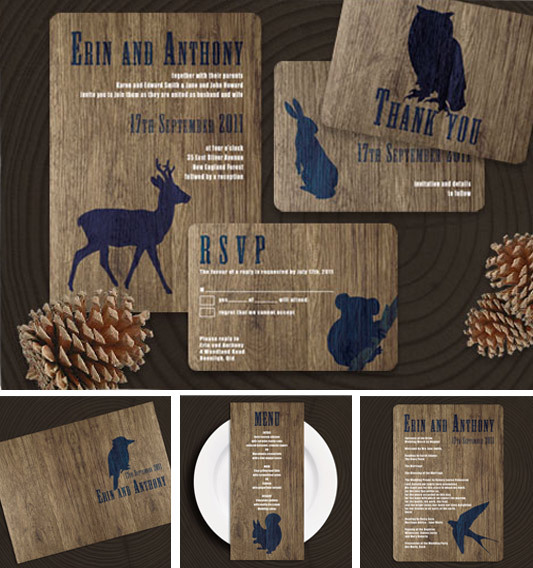 Set the scene for a magical woodland wedding with this beautiful rustic range of printable wedding stationery. Pick from a selection of Aussie, US or European birds and animals, you can use one throughout the range or mix and match from the following: rabbit, kangaroo, deer, owl, butterfly, wolf, dingo, bear, koala, squirrel and kookaburra/kingfisher. With a lovely faux wood design all part of the file - no special paper required - the range is shown here in blue but choose from a wide range of colour options. We've finished the look off by cutting our rounded corners with a paper punch. All designs are supplied as printable PDF computer files for easy at home printing - or just take to your local print shop. Available from the i do it yourself shop. Are these available?? I really want them!! !